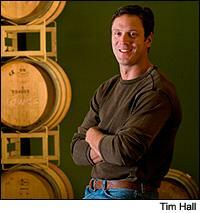 Drew Bledsoe believes that Walla Walla Valley has potential to become a world wine presence. Former All-Pro NFL quarterback Drew Bledsoe grew up in Walla Walla, Wash., a mere 200 yards from Leonetti Cellars, but he never knew his hometown was a Washington wine mecca until he started learning about wine in the late 1990s, when he and his wife, Maura, took a trip to Napa. After collecting wine for several years and learning about more and more regions around the world, Bledsoe is now building his own wine brand, Doubleback, which reflects his journey from Walla Walla High School quarterback to a successful NFL career with the New England Patriots, Buffalo Bills and Dallas Cowboys, and back to his hometown to begin a second career in the wine business. In 2003, Bledsoe purchased land in the Columbia Valley, planting Cabernet Sauvignon, Cabernet Franc, Merlot, Syrah and Petit Verdot and naming the vineyard Flying B (after his grandfather's former cattle ranch in Ellensburg, Wash.). His Walla Walla property, McQueen (Bledsoe's middle name) Vineyard, is planted mostly to Cabernet, with 5 acres of Merlot. The first Doubleback bottling will be a 2007 Cabernet-based blend made from purchased fruit by consulting winemaker Chris Figgins of Leonetti Cellars. Bledsoe spoke with Wine Spectator from his family's home in Whitefish, Mont. Wine Spectator: When did you start collecting wine? Drew Bledsoe: Around the time the 1997 Napa vintage hit. I put together a substantial cellar when we built our home in Boston, and when we left Boston I moved a lot of my collection here to Whitefish. We had a small cave built here—it's an approximately 3,500-bottle cellar, and I have about 2,000 bottles in there. WS: Which regions have become your favorites? DB: Italian wines, because they lend themselves so well to food that when you crack a bottle with a meal it always turns into such a great experience. Those wines are so interesting. I'll do various paper bag blind tastings … open a Brunello and … a big Napa Cab and at first taste, the Napa wine is so big and fruity that it's very appealing, but [when] you move into dinner and start pairing them with food, the Italian wines really start to shine and the Napa Cabs just seem overpowering. Obviously we're huge, huge fans of what's happening in Washington. I really and truly believe that the Walla Walla Valley will become a major player on the world wine scene, much more than it is today. You can get great wines out of Washington without having to pay $200 a bottle. There are times when an expensive bottle of wine is appropriate, but if you're going to open a bottle of wine every night with dinner, it's hard to justify opening a $100 bottle. When you're talking about a wine you want to open on a daily basis, Washington becomes pretty compelling because for $25 or $30 you can have a great bottle of wine from Walla Walla. WS: When did you decide you wanted to have your own winery? DB: A couple of other quarterback friends and I—Rick Mirer, Damon Huard and Dan Marino—started looking around in 2003 to buy some property in Washington and plant a vineyard. It quickly became apparent that having four chiefs, especially guys scattered to four corners of the country, was not conducive to doing anything quickly or efficiently, so that fell apart, but I kept looking around with the intention of doing something on my own. We found us a piece of property in the Columbia Valley near Echo, Ore., an 80-acre parcel that we were able to buy for pennies on the dollar compared to what you would pay in Napa. … I had no desire to come in and buy a vineyard someone had already planted. I wanted to start with the dirt and plant and develop a vineyard and start from the ground up in developing the project. … [Later], Chris Figgins was able to direct me to a really spectacular piece of property in the Walla Walla Valley. We acquired 50 acres, and just this past spring we planted 18 acres there. WS: How did Chris Figgins of Leonetti Cellars become involved with Doubleback? DB: Chris Figgins occupied the first three places on any list that I would put together for prospective winemakers, but I didn't think there was any chance that he'd be available. It didn't even occur to me to try and call the guy, but Chris' cousin called to say Chris wanted to talk to me. I went into the meeting with the intention of just picking his brain, and after 15 minutes of conversation I realized that he might actually be interested in becoming our consulting winemaker. I thought, if I can get this guy on my team, we're way ahead of the game. It almost felt like we were cheating. And Chris was really interviewing me at the same time, to see if I was actually serious or just wanted to slap my name on some ego piece. WS: Do you expect that your children will take part in your efforts at Doubleback? DB: We put them to work helping to plant some rows in Walla Walla last spring, which was really cool. Each of the four kids can have a row or two with their name on it and can be responsible for taking care of those particular rows, doing some pruning and eventually harvesting some fruit. The goal is definitely for this wine project to be a legacy for our family, with the idea that one or more of them would like to be involved in it.